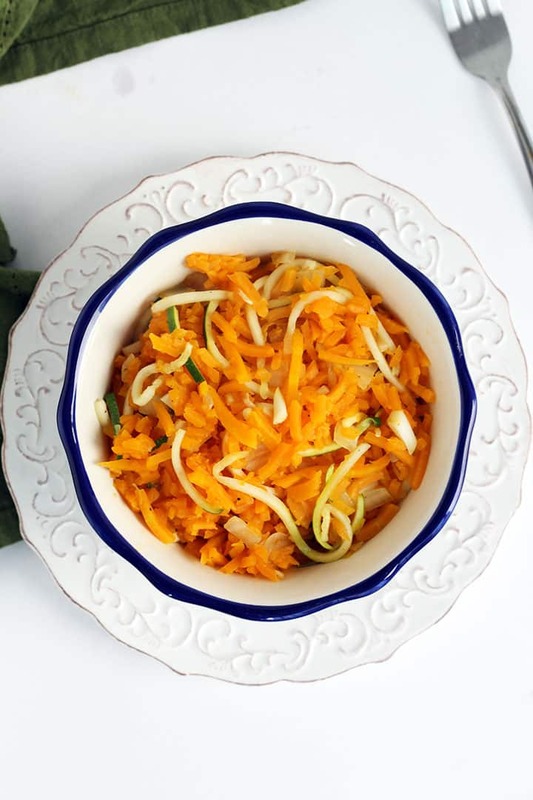 I’m building a post for this week called “How to Inspiralize Your Favorite Meals,” featuring all of the recipes from my blog that are classic pasta, rice and noodle dishes, made healthier with the spiralizer. Looking through all of my recipes, I realized there weren’t enough rice dishes for the roundup, so I’m trying to squeeze in one more before the post. Sounds blah, but it’s surprisingly one of the most delicious things ever. The last time I was in Puerto Rico visiting Lu’s family, his mother made a big batch of it. Of course, I devoured three helpings! I think there were also bits of ham in there, but it was the same premise: rice and fried noodles. In an attempt to recreate this, I’ve replaced the “arroz” (rice) with butternut squash rice and the “fideos” (noodles) with zucchini half moons. Why half moons? They’re shorter! It’s essential to use a zucchini on the smaller side (smaller in diameter) to ensure a shorter noodle. If you only have large zucchinis, that’s okay – just trim them up after spiralizing to ensure that most are shorter than 2-ish inches. 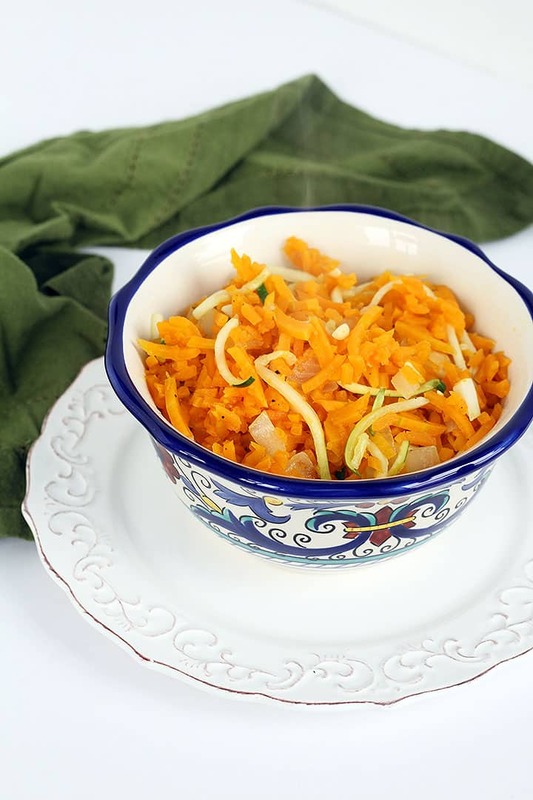 I added a few ingredients to this traditional Hispanic dish to counteract the sweetness in the butternut squash – hence the use of lime juice and onions. 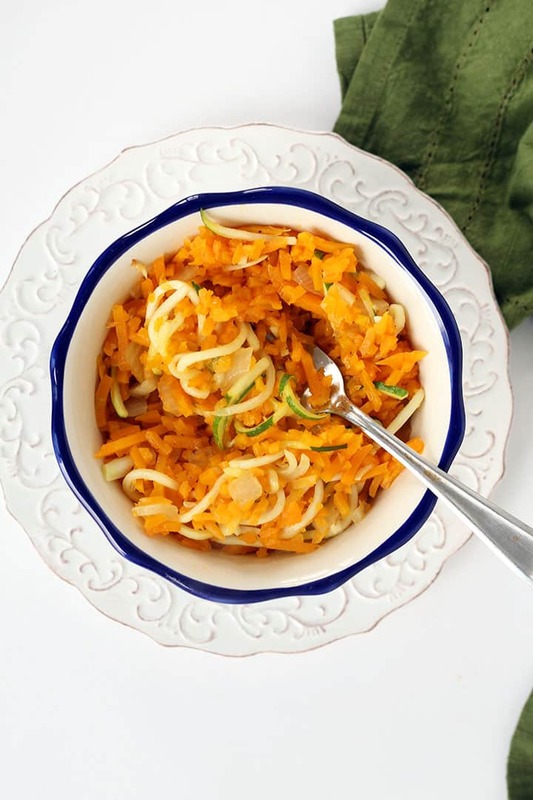 If you don’t want to attack that butternut squash, you can use these zucchini noodles with regular rice (still helps keep the processed carb count down!) or try putting the zucchini noodles into cauliflower rice or quinoa. Overall, your tastebuds will get the point – yummy noodles with fluffy rice. You really can’t beat it! Of course, something spiralized is making the menu! But, I definitely want that Hispanic-Italian fusion in there somewhere. Since this is Meatless Monday, I left out a meat, but this would work fabulously with chicken, bacon or even shrimp. Try this as a side dish – it also stores well, so build it into your weekly meal plans for lunch. While this arroz con fideos isn’t entirely like the original, it’s 100% spiralized and therefore, 100% good-for-you. 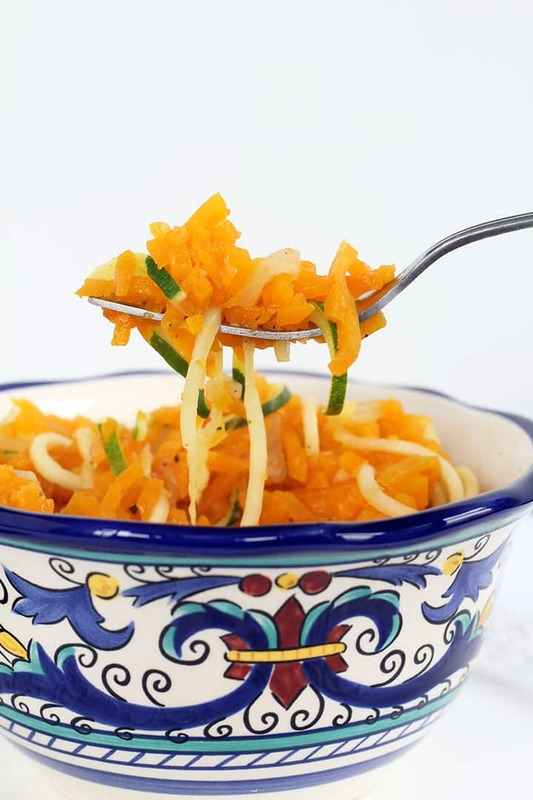 Place the butternut squash noodles into a food processor and pulse until rice-like. Set aside. Chop the ends off the zucchini and slice lengthwise in half, careful not to pierce the center. Spiralize, using Blade C. Set aside. Place a large skillet over medium heat and once heated, coat with cooking spray and add in the garlic and cook for 30 seconds or until fragrant. Then, add in the zucchini noodles and sautee for 2-3 minutes or until cooked through and al dente. Transfer to a paper towel lined plate using pasta tongs or a slotted spoon to let excess moisture drip out. If there are a few stragglers, it’s okay – you can leave them in the skillet. Immediately add in the olive oil and onions to the skillet and cook for 2-3 minutes or until onions are translucent. Add in the butternut squash rice, season with salt and pepper, stir and add in the chicken broth and lime juice. 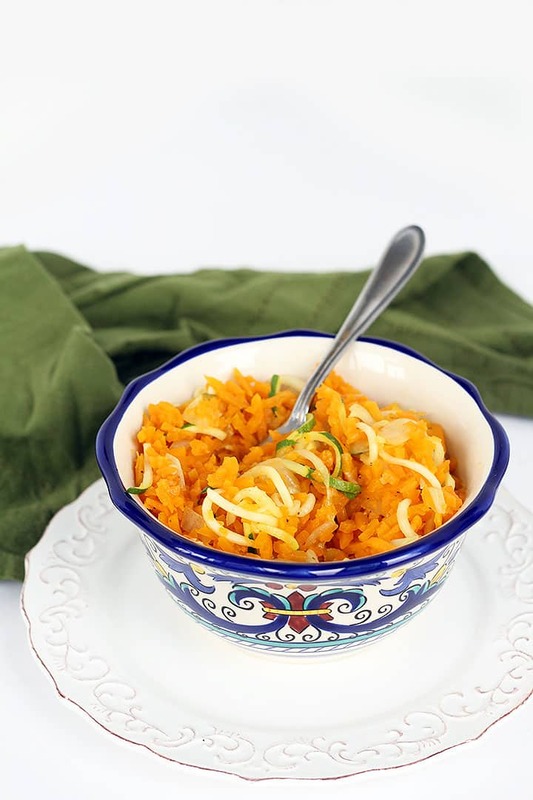 Cook for 5-7 minutes or until butternut squash is cooked and is a soft, rice-like consistency, stirring frequently. Once done, add the zucchini noodles back to the skillet, give one big toss and transfer to a serving bowl. this looks great - really enjoying trying out all your recipes with my spiralizer! yes!! would love to see Friday features on the blog that tracks your healthy fit journey! I'd love to see a Friday feature that tracks your healthy fit journey! Might help inspire me to get healthy and fit myself. This looks good as a side dish or entree. A Friday feature would be nice - a reminder to all to stay on track over the weekend! Looks amazing! I am currently on Whole 30 and no rice is killing me!! Your recipes have saved me on this! :) Thank you for all you post! This looks fabulous! I'm putting it on the menu later this week. I'll probably add a bit of Canadian bacon to the dish, but I'm sensing delicious already! We tried your Brussels sprout salad with apple and almonds last night - huge hit here! I had a small bag of zucchini noodles so threw that in as well, plus toasted the almonds with salt and honey Nick Stellino style. Topped it with grilled salmon. Pretty enough for a special company dish with all the colors. Keep it up, we're loving it! for the Caribbean/Italian fusion - have you ever had/made a pastelon? Very much like a lasagne but with plantains (not too ripe but still sweet maduros) as the noodle, and then a picadillo type meat sauce layered in between and baked. Maybe a little heavy for a wedding but delicious in any circumstance. Holy cow, this is so yummy! I just made a batch & it is almost all gone. I was a bit skeptical at first (how good could this combo of veggies really be??) but then tasting is believing. Super yummy. I added some white sweet potato (just because I had then & thought they would also make good "rice"). So good. I just bought my spiralizer & someone pointed me in your direction. I'm so glad they did! Can't wait to be inspiralized some more. Mexican fideo has a blended mix of tomatoes, garlic, onion and a pinch of cumin then you add chicken broth to make it more of a soup. Its yummy!